A British teenager who fell 70ft (21m) from a balcony in Magaluf has died. 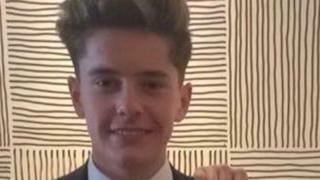 Thomas Channon, 18, from Rhoose near Barry, Vale of Glamorgan, is the third holidaymaker from the UK to die at the Eden Roc apartment complex this year. He was celebrating the end of his A-levels at the Spanish party resort. The Foreign Office issued a statement on Saturday saying: "We are assisting the family of a British man who has died in Mallorca, and are in contact with the Spanish authorities." Mr Channon was staying at the nearby Universal Hotel Florida and Spanish police believe he wandered into the complex after losing his friends at around 04:00 local time on Thursday. His body was found later by a gardener. It is understood his parents have flown to Mallorca. A mother of one of the teenagers on holiday with Mr Channon, who did not want to be named, said: "We went to where Thomas fell and the wall is way too low. It's about knee height. "When you look at it there are loads of trees and bushes beyond the wall which gives the impression there's a garden, but there's actually a 70ft drop. "Three kids dying here this year is just unbelievable. We're furious." One of the Channon family's neighbours, who did not want to be named, said: "We do not know what has happened but it is very sad. They are such a lovely family and always very friendly and always say hello. "Thomas and his brother are lovely boys and always very polite. It is just so sad." Another neighbour said: "They're lovely neighbours. Really good people." In June, 20-year-old Tom Hughes, from Wrexham, also died after falling about 65ft (20m) from the apartment block. An online appeal raised more than £11,000 to "bring Tom home". An inquest has been opened into his death with the cause of death to be determined. And in April, Scottish teenager Natalie Cormack fell to her death from the seventh floor. Spanish police said the 19-year-old fell while trying to climb into her apartment from a friend's flat. They said it appeared Ms Cormack forgot her keys when she returned from work in a bar. The Foreign Office has previously warned British holidaymakers about taking risks on hotel balconies abroad. "Look out for friends and family and avoid doing anything that might cost a life", it said.